WATERLOO – Wilfrid Laurier University and the City of Waterloo are partnering to launch CityStudio, an innovation hub where students, city staff and community stakeholders co-create solutions that support the city’s strategic priorities. A ribbon-cutting event will take place Monday, Nov. 7 at the Carnegie Library on the Albert Street side in uptown Waterloo, from 11:30 a.m. to 12:00 p.m. Inspired by CityStudio-Vancouver, the CityStudio project in Waterloo will be an innovation hub where students, city staff and community stakeholders co-create new ideas and solutions to challenges confronting the city. The one-year pilot program will offer city staff and students the opportunity to engage, support and advance the goals and objectives of the City of Waterloo Corporate Strategic Plan. CityStudio will be based in the basement level of the Carnegie Library, with a designated studio entrance off Albert Street. The inaugural Laurier-led class will begin in January 2017. “The Carnegie Library is named after a man who wholeheartedly believed in giving back to society. It’s fitting that this historical building will be a place of learning and collaboration where students, academia, business and government come together to innovate ideas and improve the quality of life in our community,” said City of Waterloo Mayor Dave Jaworsky. 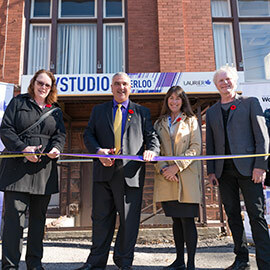 Laurier will launch a CityStudio course in the Carnegie Library space beginning in January. Third- and fourth-year students will participate in an immersive, experiential learning course where they work alongside city staff to co-create, design, launch and test real projects that align with city priorities and community needs. Faculty and staff from the Global Studies Department in the Faculty of Arts will deliver the academic program in CityStudio. Laurier is a leader in social entrepreneurship and social innovation and was recently awarded the prestigious AshokaU Changemaker Campus designation. This international designation recognizes Laurier as a global leader in social innovation and social entrepreneurship education. Laurier’s Schlegel Centre for Entrepreneurship and Social Innovation provides training, opportunities, supports and funding to students, staff and faculty in the Laurier community for initiatives that apply entrepreneurial thinking in the social sphere.